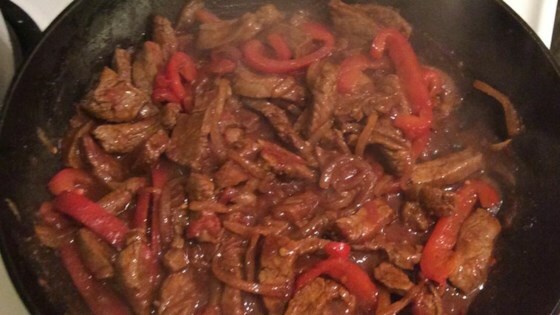 "I love a good fajita but have never been satisfied with most restaurants I've gone to. I've come up with a basic recipe you can build from that is awesome in itself. Give it a try! The meat is key in a good fajita. It must melt in your mouth along with all the other fixins you put into the tortilla. Serve fajitas in warm tortillas topped with fresh guacamole, garden salsa, and fresh cilantro." Flatten flank steak slightly with a meat mallet. Rub shichimi togarashi into both sides of steak, wrap the steak in plastic wrap, and refrigerate for 8 hours or overnight. Combine orange juice, soy sauce, lime juice, orange zest, and lime zest together in a resealable plastic bag. Remove flank steak from plastic wrap and place the steak in the resealable plastic bag, coat with the marinade, squeeze out excess air, and seal the bag. Marinate in the refrigerator for 2 hours. Remove steak from marinade and pour marinade into a small bowl. Cook steak on the preheated grill, basting with the marinade every 5 minutes, until it starts to firm and is seared on the outside and reddish-pink and juicy in the center, 8 to 10 minutes per side. An instant-read thermometer inserted into the center should read 135 degrees F (57 degrees C). Cut steak in half lengthwise and cut across the grain into thin slices. Whisk cornstarch, chili powder, salt, paprika, brown sugar, cayenne pepper, red pepper flakes, onion powder, garlic powder, and ground cumin together in a bowl. Heat oil in a large skillet over medium-high heat. Saute onion and red bell pepper in hot oil until soft, 5 to 10 minutes. Add sliced steak, chili powder mixture, and water to the skillet. Cook until sauce thickens and meat is glossy, 3 to 5 minutes. Experience full-swing summer in every bite of these quick and spicy fajitas! If you can't find the shichimi togarashi, just sprinkle kosher salt, some cayenne pepper, 1 tablespoon brown sugar per side, and ground black pepper and rub it all in both sides. I used the dry ingredients as a rub on the steak, set it in the fridge for 6 hours, and then grilled it. Perfect balance for us. Good but very spicy. Next time I will cut back on the spices. I mesquite smoked the meat on the BBQ, was delicious! Super spicy but don't let that stop you. The recipe base is amazing. Just control the amount of heat by reducing the spicy ingredients.